Smooth and silky papaya shake prepared with this recipe is a perfect blend of ripe papaya, cold milk and honey. 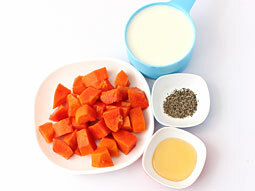 The suggested black pepper powder seasoning gives an extra aromatic punch and compliments the sweet smell of papaya. Having papaya milkshake in breakfast is a best way to get entire daily requirement of vitamin A, C and E, and antioxidants in a single go at the start of the day itself. Choose ripe papya which has orange skin and sweet aroma. Discard papaya seeds while chopping it. Combine all ingredients (except pepper powder) in a blender and blend until puree. Add ice cubes and blend again on high speed for 30 seconds. 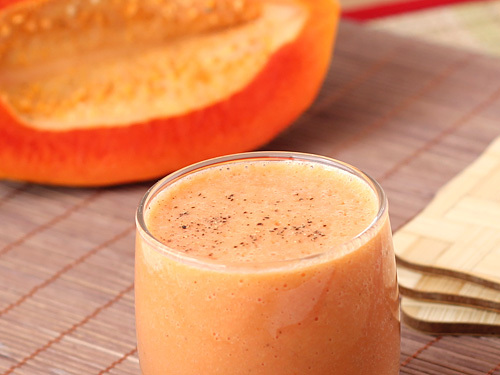 Pour prepared papaya shake in a serving glass. Sprinkle black pepper powder over it and serve. Replace milk with orange juice for zesty shake. Add 1 banana to make it creamier and thicker. 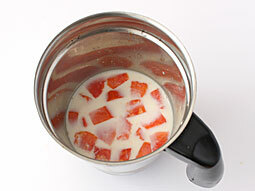 Add vanilla ice cream and use milk to prepare creamy milkshake of papaya. 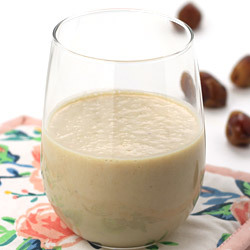 Serving Ideas: Apart from having this shake in breakfast, serve it with light snacks in the evening during hot summer. Thanks for this recipe, totally delicious. I tried this recipe. It's yummy. Used almond milk instead of regular milk. Tastes like cheerios. It has made cooking so simple. And, coming to shake which I made it, it was awesome. Wow...I prepared very yummy shake after getting recipe from this site.